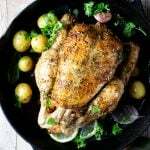 This method for making a lemon roast chicken couldn't be simpler and it comes out perfect every time. The chicken bastes it's self and comes out extra juicy and full of flavour. Preheat the oven to 180°C (350C)and pierce the whole lemon all over with the tip of a sharp knife, set aside. Pat the chicken dry on all sides with kitchen paper. Season the cavity of the chicken well with salt then add two garlic cloves and a whole pierced lemon. Add the dried herbs, sea salt and chilli flakes over the chicken and drizzle over the olive oil, rub all over the chicken. Turn it upside down on a baking tray and place in the preheated oven. Roast for 45 minutes then remove from the oven and turn the chicken around. Roast for another 45 minutes, the skin should be nice and crispy. Remove from the oven and let the chicken rest for 20-30 minutes. Enjoy. How Long To Cook A Roast Chicken For? Roast the chicken for 1 hour for every kilo (2.2 lbs). I roast this 1.6kg chicken for 90 minutes and it's perfect every time. If you're unsure if the chicken is cooked right through or not then insert a knife into the thickest part of the chicken leg and if the juices run clear it's ready. Pat the skin dry with paper towels first. Removing the moisture from the skin helps make it extra crispy. Always pre-heat the oven, seems obvious but it's essential for making the perfect roast chicken. Choose a free range chicken...the happier the chicken the tastier the meat. It's worth spending more on good quality ingredients especially when it comes to meat. Rest the chicken after roasting - this is an important step. If you start to slice the chicken as soon as it's out of the oven then all of the lovely juices and flavour will literally evaporate and run right out of the chicken. The meat will also dry out so resting is essential!